Mixed Choral Chorus from CA. Certainly one of our most unusual Christmas CD's on offer, these 1956/57 recordings are a blast of refreshment. The first 12 tracks, from "Calypso Holiday," are accompanied, sung in tribal languages as well as English, French and Spanish, and are guaranteed to cheer up anybody's holiday blues! Songs such as "Yellow Bird," "Pig Knuckles and Rice" and "Bamboo-Tamboo" are a wonderful break from the traditional carols, but lest you miss them, "Songs Of Christmas," features a series of medleys, all a cappella and arranged by Norman Luboff. The Norman Luboff Choir were quite popular in the '50's and '60's, too commercial to be considered classical, but nonetheless their renditions of the holiday chestnuts are first-rate. The Norman Luboff choir is one of the great choral folk/pop groups of all time, and "Songs" is one of those great 2-LPs on one CD compilations that give you so much great music for your money. First released in 1959, these 24 (all but one song accompanied) songs embrace the music of many countries, most of which are fresh to our ears today, but nonetheless smooth, rich and beautiful. The one a cappella tune, "Dear Fatherland, Farewell," is a nostalgic winner with bass harmonies to die for. Soloists William Reeve, Betty Mulliner and William Lee amaze us and break our hearts. Some of our favorites: "Lift a Glass to Friendship" from Poland, "Pepita" from Portugal, "Bamboo Flute" from China, "Cockles and Mussels" from Ireland, "The Lonely Birch Tree" from Russia, "Valencianita" from Venezuela - all are wonderful and touching. Highly recommended! 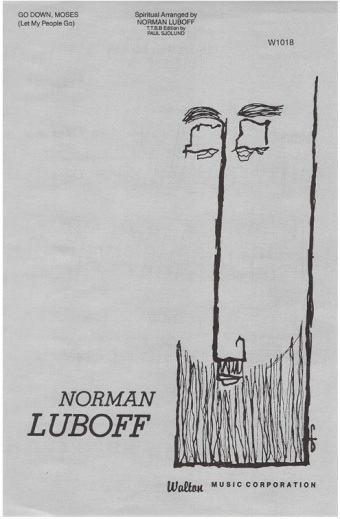 Here are 19 songs, all from the movies, all arranged and conducted by Norman Luboff, A true musical eclectic, Luboff was driven to render every piece with a painstaking exactitude and an arrangement that immediately defined it as a Luboff performance. His choir toured annually from from 1963 until Luboff's death in 1987, and recorded more than 75 albums. This perfectionism is clear on every cut of every Luboff album, of which four, from 1961-65, are represented here. "All the Things You Are," "It Had to Be You," "As Time Goes By" (which Sam played again in "Casablanca," but actually was from the 1931 musical "Everybody's Welcome"), the title tunes from "My Foolish Heart," "Days of Wine and Roses," "High Noon," "On Green Dolphin Street," "An Affair to Remember," "Ruby" (from "Ruby Gentry") and "Laura," the lovely "Unchained Melody," "I'll Get By," "The Song from Moulin Rouge" ("Where is Your Heart"), and Irving Berlin's wonderful "Remember." Luboff is an American master, and his choir is one of the most powerful vocal groups of all time. Sure, all songs are gently accompanied, but the focus is on the smooth-as-maple syrup harmonies. These songs unabashedly tug at our heartstrings and push every romantic and sentimental button, and all we can say is, "highly recommended!"